There are thousands of alcoholism treatment centers. Many have programs that provide a high level of care, but there are also many that will take advantage of you and treat you with substandard solutions. For this reason, It's important to do your research, ask the right questions, and know what to look for. Though 15.1 million Americans over the age of 18 were living with an alcohol use disorder in 2015, according to the Substance Abuse and Mental Health Services Administration (SAMHSA) 2015 National Survey on Drug Use and Health (NSDUH), only about 6.7 percent of this number received the treatment they needed to heal. Similarly, SAMHSA’s 2015 NSDUH found that about 623,000 youth between the ages of 12 and 18 were living with an alcohol use disorder yet only about 5.2 percent of that number sought treatment. This is likely due to a widespread lack of recognition that alcohol use at certain levels is indeed a threatening and potentially fatal issue that requires treatment as well as the feeling that there is no access to the comprehensive treatment that is needed to stop drinking safely. The fact is, however, that there are a number of options available for people in need of treatment for an alcohol use disorder, whether the problem is binge drinking, alcoholism, or somewhere in between. For many, the journey to recovery starts right here. 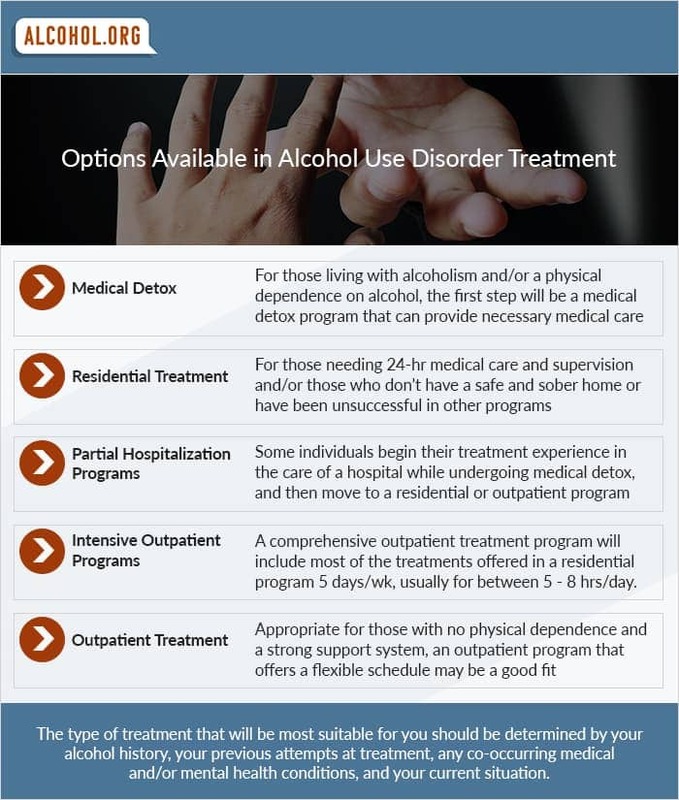 Medical detox: For those living with alcoholism and/or a physical dependence on alcohol, the first step will be a medical detox program that can provide necessary medical care. Residential treatment: For those who require 24-hour medical care and supervision and/or those who do not have a safe and sober home or have been unsuccessful in other types of programs, residential treatment provides an immersive treatment experience. Partial hospitalization program: Some individuals begin their treatment experience in the care of a hospital, undergo medical detox there, and then transfer into a residential or outpatient addiction treatment program. Intensive outpatient program: A comprehensive outpatient treatment program will include most of the therapeutic interventions and treatments offered in a residential program five days a week, usually for between five and eight hours per day. Outpatient treatment: Appropriate for those with no physical dependence on alcohol and a strong support system at home, an outpatient treatment program that offers a flexible schedule may be a good fit for those who would like to stay actively involved in work or school. It is the nature of addiction to make normal challenges feel insurmountable, and this applies when it comes to finding and embarking on a treatment program to address alcoholism. The fact is, however, that no challenge is insurmountable. There is a program that is right for everyone who is living with an alcohol use disorder. It is just a matter of taking the steps to begin. Explore the following articles for more in depth information on the treatment process, or, if you want answers now, call our American Addiction Centers 24/7 helpline.